The apocalypse depicted in Revolution corrects a myriad of modern injustices, from laziness to sloppy living to overindulgence; it's soon clear that for all the heroes' battles with evil soldiers and bandits patrolling the land, it's the pre-blackout fast-paced, materialistic, digitally fixated society that represents the real dystopia. Thanks to worldwide catastrophe, TV- and iPhone-hypnotized children morph into capable, imaginative teenagers hunting and gathering to their hearts' contents, echoing the pastoral reveries of The Hunger Games. Millionaire Google executives are reduced to awkward, cowardly geeks who stoop over to catch their breath every few minutes. The injustice of high-tech, remote-control weaponry is supplanted by the much more egalitarian rigors of hand-to-hand combat. Best of all, the handsome, well-muscled teenager started out as our damsel in distress, thanks to his dependence on asthma inhalers. As he sighed and pouted in captivity for the first few episodes, his more able-bodied older sister colluded with a loosely knit band of rebel forces to overthrow the local militia. Throw in some fancy braids and fruity cocktails and you've got an apocalypse worth daydreaming about. It's hard not to feel a rush of yearning for this simple if violent existence. The characters' goals are concrete and simple: hit the road in search of help or information; subvert your malevolent overlords - local, observable foes, as opposed to the faceless, splintered, omnipresent enemies we increasingly protest; hide your firearms and your American flags from evil outside forces. Even romance is more straightforward. Instead of texting with our heroine, a handsome cross-bow-wielding stranger saves her life by sticking an arrow in her assailant's chest - a move that's not only more direct than a winking emoticon, but also reflects favorably on his adaptive traits at a time when these things clearly matter. Be sure to read the whole essay at Vulture. 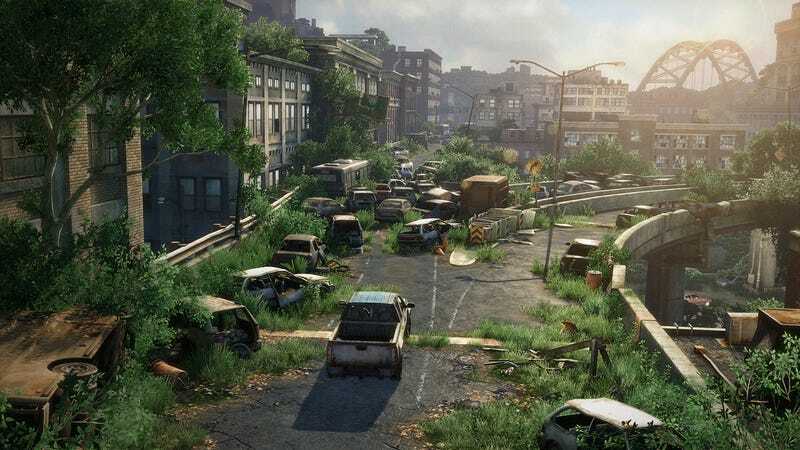 Image taken from the videogame The Last of Us, from Naughtydog.